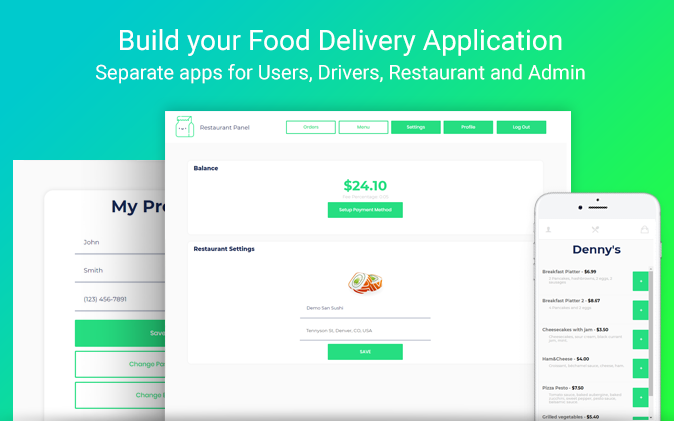 we have just published a new which is a Food Delivery application similar to Uber Eats, Food Panda or Deliveroo. It features apps for users (mobile first), drivers (mobile first), restaurant owners and admins. The template comes with automated payments through stripe to all parties involved. Users can add food items from their favorite restaurants to the cart, pay for the order and delivery and then get real time delivery status updates. I just purchased this template yesterday and though I’m almost finished with the lessons, I’m still having a hard time doing (what seems to be simple things). Is there anyone available that can help me understand how to successfully use this template? Thanks! we could help you understand the general things about the template (like database structure etc.) but we wouldn’t be able to go into much details for the customizations and modifications. Post your questions here and we’d be glad to assist you. It requires time and patience studying all the elements, workflows and settings of the template so I’d suggest you go slowly and experiment with things. Don’t be afraid to mess anything in the app as you can always delete it and create again using the template you purchased. I’ve added my food items to the data but they are not showing up when i select them. Each different restaurant is showing up not the food item. It seems for me like you have not linked the food items to the restaurant. Did you use the restaurant dashboard to upload the “food”? If so, was you logged in as “Site Admin” or “Restaurant Owner”? If all is true, what you see in table with “menu items”? Do you see the restaurant tied to each item? That is probably so, but I’ve purchased another food delivery uber eats clone app that I found to be much more user friendly to me as someone who is brand new to everything that is bubble.is. But thank you, when I play around with that app again I’ll be sure check that out, it might have been my issue. I still want to master that app template as well. Hey there, I have this template, and I am trying to charge for mileage. I have used the “distance from” between my two addresses, *x it that doesn’t work. It’s just seems to make up a random number. I thought I it may be the formatting of the expression, but changing it around didn’t work either. Any thoughts? +searchboxa distance from searchboxb*0.25 to calculate the distance and provide the number of kms to charge for. But, that calculation throws off the entire expression. The charge ends being a random amount. Thanks Levon. That didn’t seem to work. But, I did run into another issue - in the orders group on the restaurant page, it show all the orders made on the platform, not just the orders for that particular restaurant. I tried changing it to parent groups orders, but I couldn’t determine what dB entries I needed. Is there a reason it shows all orders? Hello @cotekris, thanks for reaching out! it show all the orders made on the platform, not just the orders for that particular restaurant. It’s happens because all restaurants are created under same user. Also we just made a template update. Made a little UI and functionality fixes. Thanks. Two more questions, when you push updates, does it break any changes we make to the template? And, can the driver accept more than one delivery request at a time? If not, can that be done? can the driver accept more than one delivery request at a time? If not, can that be done? Hello. I have a question about the ability of this template: Can I have several different locations, each containing a different selection of restaurants (some the same and some different), and be presented a geo-located (or at worst a manual location entry) list of restaurants depending on where the app is located? In other words: city A has Food 1, Food 2, and Food 3. city B has Food 2, and Food 3. If phone is in city B only Food 2 and 3 are shown from where to order, yet if phone is in city A, all three restaurant choices show up. I am eager to learn about this template. I am new here thank you for your patience. Hi Pablo, thanks for reaching out! hello guys! Is there a way to setup the drivers request? I would like to send out a notifications to ALL the drivers within an area and the first one to accept or reply will get the delivery instead of just sending the notification to the closest driver? Like a bat signal of some sort!